If you have space only for a table at your exhibit, you had best maximise what you’ve got by printing your logo on a tablecloth. These printed table cloths do more than just decorate your space. They define your space and advertise your brand to your target audience. We offer professional table cloth printing services. Our 8ft corporate logo table cloth print is the ideal solution that will help you not just decorate your exhibition stand, but will also make a statement at the expo hall. It is eye-catching and clearly conveys to your target customers who you are and what you offer. This piece of fabric is specifically designed for an 8-foot long table. At 210gsm, this fabric is thicker than many of the tabletop cloths you’ll find in the market right now. We usually have four-sided tablecloths in stock, but if you prefer to have room to fit your legs under the table when you sit at your exhibition space, we can give you the three-sided or “open back” option. More importantly, you can choose any colour of table cloth that you want. We use the latest dye sublimation printing process to print out not just your logo but also the cloth colour itself. Just pick out which hues you wish to use from the Pantone colour library. As mentioned earlier, we use dye sublimation printing to create our fabric printouts. This printing method is the most accurate printing technology we have available right now. It produces images that appear as if they have been processed in a photo lab – clear, crisp and vivid. Moreover, the printed image stays flat and smooth on the fabric, and it will not fade even if it is washed or dry-cleaned. How does dye sublimation work? This process works by printing an image’s mirror likeness on special transfer paper that is highly resistant to heat. Using very high heat and pressure, the printout is pressed onto the fabric. The heat of the pressing machine causes the ink to change from solid state to gas, completely skipping the liquid state. The ink then infuses the very threads of the fabric to create a permanent print. Aside from our high-quality prints, we also aim to give you the best service you will find in the industry. We offer you a wide range of options so you can come up with the best tabletop cloths most suited to your needs. We additionally intend to help you save time and money with your purchase. When you buy corporate logo tablecloths from us, we will ask you to provide us your design. We can also create the layout for you if you prefer it. Additionally, we will request you to choose your desired colours from the PMS colour chart, a book that lists known shades of specific colours. For instance, if you want a yellow table cover, you can specify the particular shade you want: canary yellow, cadmium, goldenrod, daffodil, dandelion, lemon, and so forth. And then, if you require it, we will present you with a sample print before we produce the final output so you can create changes as necessary. This step ensures that the tabletop cloth will come up exactly how you want it. We don’t require minimum orders. So, if you only need one printout, you can order just one without any extra charge. Moreover, our printouts automatically come in full colour so you don’t need to pay us any additional fees for colours. Most of all, because the cloths are produced using dye sublimation printing, you can use them as many times as you want without any worry that the printout will crack or fade. The image stays permanent even when washed or dry-cleaned. Thus, you won’t have to buy another printed tablecloth anymore unless you really need to. You can even use the cloth for other shindigs, such as corporate events and press conferences. 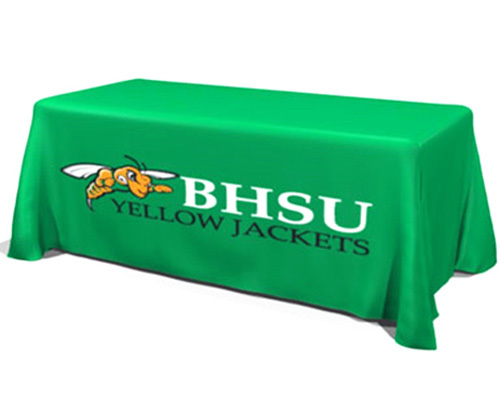 You will really enjoy a lot of advantages when you get our 8ft corporate logo tabletop cloth. It will help you make the most of your available space at the expo. Call us today for more information about this product.